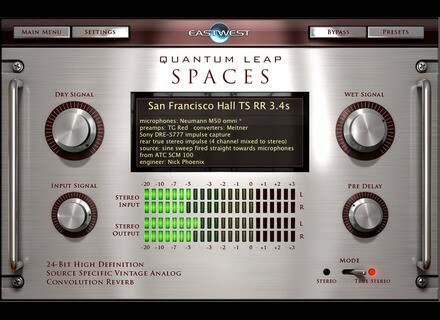 Quantum Leap Spaces, Software convolution reverb from EastWest. 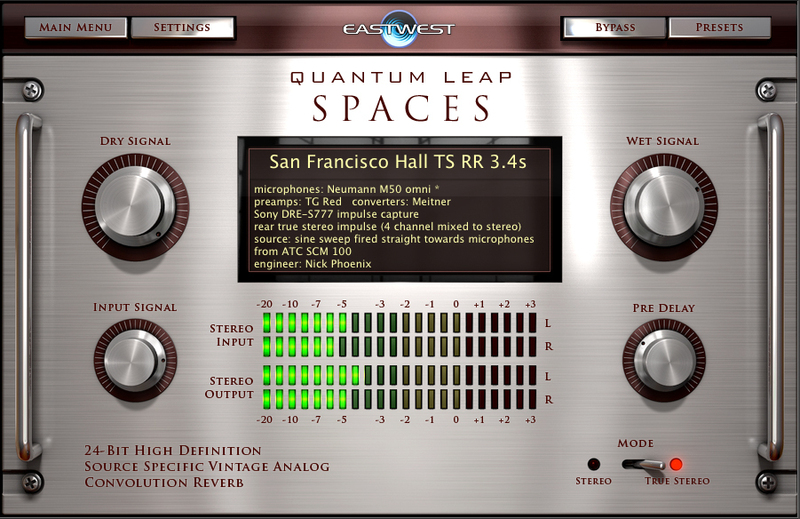 EastWest announces Quantum Leap Spaces, a new, 24-bit true stereo convolution reverb that utilizes new impulse recording techniques developed over the past seven years. Produced and engineered by Nick Phoenix, Quantum Leap Spaces includes custom impulses taken over the past seven years from around the globe, with a focus on the western United States. Concert halls (including the EastWest/Quantum Leap Symphonic Orchestra Hall), churches, cathedrals, caverns, recording studios (including EastWest Studios), soundstages, forests, a swimming hall, parking garages, water tanks, a tunnel, vintage plates and custom digital reverb preset impulses ensure you'll find the right space to fit your needs, the company says. Gear from Neumann, Neve, Telefunken, TG, Manley, Sennheiser, Fairchild (to name a few) was used to create Quantum Leap Spaces, along with the Sony DRE S777 sampling reverb and Meitner A-D converters. ATC monitors were positioned in the room/hall to emulate the real world sound projection properties of various instruments. Most impulses are in 8-channel format to accommodate surround mixes. Quantum Leap Spaces is available for both MAC and PC for $299 MSRP. For more information, or to download a trial version (iLok required) visit www.soundsonline.com/spaces. [NAMM] Misa Digital Kitara Video Demo New Misa Digital Kitara video on AudioFanzine. [NAMM] IK Amplitube iRig & Vocalive Video Demo New IK Multimedia - iRig & Vocalive on AudioFanzine.